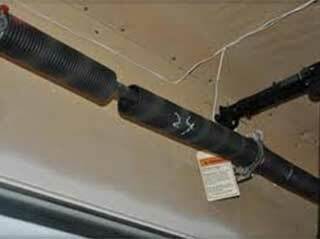 Among the most important parts of your garage door are its springs. They do all the heavy lifting and take the weight of the door each time it’s cycled up or down. If they fail, you won’t be able to use your door at all. For this reason it’s essential to make sure they’re kept in good working condition. Over time, your springs will suffer wear and tear, and they’ll eventually need to be replaced. This handy guide will help you identify when the springs in your door are wearing out and help you decide if they should be replaced or not. As your garage door springs begin to wear out, they’ll lose their strength. They won’t be able to support the full weight of the door, and this can cause several symptoms to appear. If your door starts to wobble as it moves, it's possible that it isn’t being held under the right amount of tension which means that the springs could be wearing out. You cannot repair or replace door springs yourself - it’s very dangerous to do so if you’re not a trained professional. However, you can perform some simple tests to identify whether your springs are in need of attention. Firstly, try manually opening your door. If your springs are in good condition this should be easy; they’ll take the door’s weight, and you won’t have to work hard to move the door. However, if they’re worn out (or even broken), you’ll find it a real struggle to lift the door. A second test that can help identify spring issues is to raise your door, then pull gently on it. Healthy springs should hold the door strongly, but if you find the door pulling down easily, your springs may well be close to worn out. These springs are designed to last between 7 and 12 years, but it’s sensible to perform these tests regularly to catch any developing problems. If you identify a potential problem with your springs, do not be tempted to carry out repairs yourself. Our highly trained team of technicians is ready to quickly and safely perform spring replacement or maintenance - contact our experts at Garage Door Repair Inglewood today!